When we first started VScreen seven years ago, we had a great marketing idea: exhibit at real estate conventions and provide video services for agent profiles in our booth. We were absolutely sure that this was the “wow factor” we needed to launch the company in a way that showcased our skills and attracted clients, like moths to a porch light. We arrived at the first convention, hyped and optimistic, with everything we needed to do a top-notch job: cameras, lighting, green screen, editing technology, plus a team of video pros. There was one clear and obvious problem: No one wanted to get in front of the camera. Though hundreds of interested attendees stopped at our booth, everyone had an excuse as to why they couldn’t shoot a video, then and there. A few promised to come back once they ditched the flashing beads, changed clothes, teased their hair and piled on the makeup to perfection. But no one ever did. Not one single person. What we quickly learned was a very expensive lesson for our genius selves: that most people hate the way they look on camera. The good news: You don’t have to be in front of the camera to create effective videos for your personal brand or company. Why not choose someone else on your team to be your company spokesperson? Or rotate team members to build company morale and give everyone their time to shine. Think about hiring a professional actor to talk about your company. You can always find acting students willing to work for little to no pay in order to add your video to their demo reel. In fact, an actor might be the better option if you’re paying a freelance videographer hourly. Unlike you, actors are less likely to freeze in front of the camera or waste billable hours flubbing their lines. Then again, you may want to create your own video content. With excellent online editing tools at sites like Animoto, Videolicious and Magisto, you can easily shoot and edit video with your smartphone or tablet. And, with prices ranging from free to as little as $10 to $40 per month, it’s certainly more affordable. But what if you’re camera-shy? Here are some ideas that can solve the problem while increasing your YouTube views. Camera-shy? 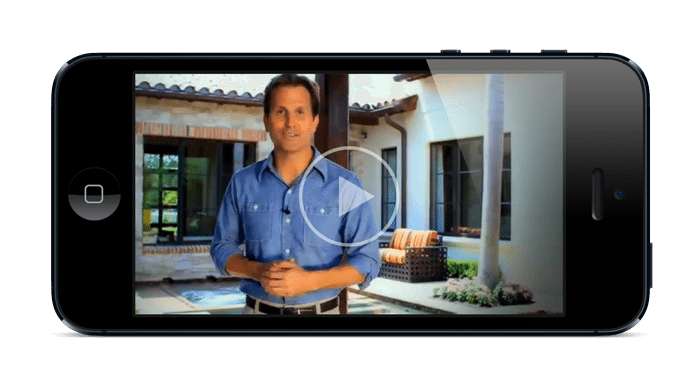 Opt for video content created by others, like this one on “pool design” from MarketVideos.com. Let’s say you want to shoot a “run and gun” community video. You can stay behind the camera while you interview neighbors, store owners or the chef at a local restaurant. First, make sure everyone looks into the camera, states their name, and gives you permission to use their likeness in your video and marketing materials. Once that is done, ask them about the neighborhood, cafes, venues, local schools and parks, community activities — the list goes on. Not only will this be more interesting than seeing one person speaking the entire time, the people who end up in the final cut will share your video link with friends and family, on Facebook, and from there it might even go viral. There’s a final option: video content created by others. Link out to “HGTV types” of video on your blog or Facebook page, then build your brand story around it. Or look into turnkey programs like we offer agents at MarketVideos.com, in which we inexpensively package new consumer-oriented video content each month, alongside the market videos branded with your photo, company logo and contact information. No matter which solution you use, being camera-shy is never an excuse to miss out on the power of marketing your personal brand or company with video.